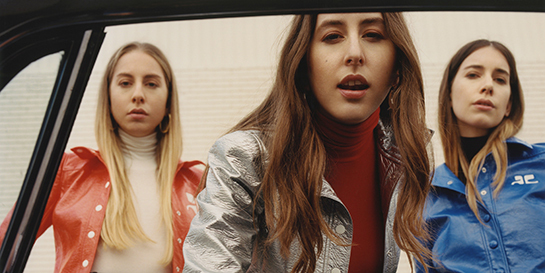 HAIM reunited with Grammy-winning Ariel Rechtshaid to produce the album, with Polydor set to release the official first single on May 3. In the States, the girls will be performing on Saturday Night Live, hosted by Melisa McCarthy, on May 13 for a live debut of new music. UK fans will have a chance to see the Californian sisters perform new material live in the summer, as they have been confirmed on the line-up at Reading & Leeds, Glastonbury and Radio 1’s Big Weekend. Polydor began hinting the trio’s return earlier this month, with a billboard spotted in Shoreditch, London. The teasing stepped up a gear when the band began sharing short videos and teasing the date April 27. After winning BBC’s Sound Poll in 2013, the multi-talented sisters released their critically acclaimed debut Days Are Gone, which went straight to number one and was listed as album of the year by several publications including Pitchfork, Rolling Stone, Time Out and Complex. Since that record’s release, the girls have worked on tracks with Bastille, Calvin Harris and Stromae.